Cheryal Ann Denny, 69, of Cleveland, Texas passed away on Friday, April 13, 2018 She was born on Tuesday, November 16, 1948 in St Louis, Missouri to Norman Edward Turnbow and Majorie Esther Turnbow, both of whom have preceded her in death. 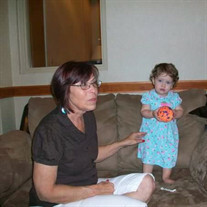 Cheryal was also preceded in death by her granddaughter, Adrienne Brown. Left to cherish her memory is her loving husband David Denny; daughters, Dana Brown, Carrie Spring Denny; son, Parrish McPheeters and wife Holly; sisters, Jill Baum, Trenna Graham and husband Len, Zoraida Herrera; grandchildren, Cole Brown, Justin Brown and wife Cheyenne, James Bagley, Shane Bagley, Anne McPheeters, Ray McPheeters, William Castillo and wife Karla, Desean Gore, Quincy Gore; and five great-grandchildren; along with numerous other loving family and treasured friends. Visitation for Cheryal will be Monday, April 16, 2018, at Neal Funeral Home, at 6 p.m. to 8 p.m. Funeral for Cheryal will be Tuesday, April 17, 2018, at 11 a.m., at Rural Shade Baptist Church. Interment will be at Ryan Cemetery.